Weak, dull, brittle, dry, or splitting, to name just a few. These are the signs that your hair’s condition badly needs improvement. To provide professional care, use Cameleo products for damaged hair which contain keratin, an enhancer of hair structure regeneration. But using even the best possible products is not enough. Healthy and balanced diet is equally important. 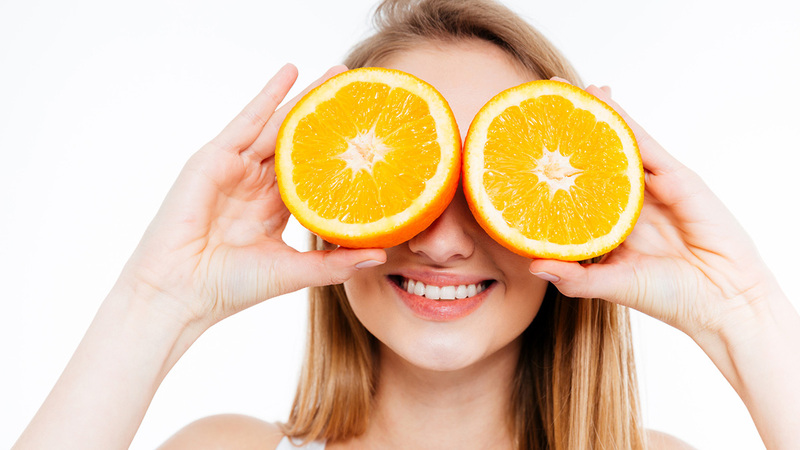 Nutrients keep your hair good looking, so make sure that you eat right! • „Junk food”, pre-prepared and packaged food, for example fast food, instant soups and sauces, and jarred food. 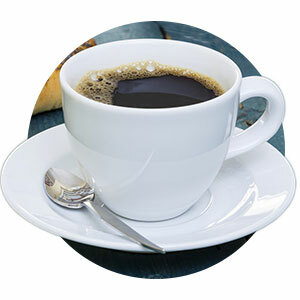 It usually contains excessive preservatives, fat, salt, sugar, and other harmful improvers. The high content of salt is especially disastrous for your hair, as consuming it in large amounts might make your hair dry and dull. • Fatty food, especially deep-fried. Fried meat and chips enhance the excessive production of sebum which makes your hair oily and weakens it. Moreover, fried and smoked foods contain harmful toxins which might damage the hair structure. • High-sugar food (also simple carbohydrates found in bananas and grapes). 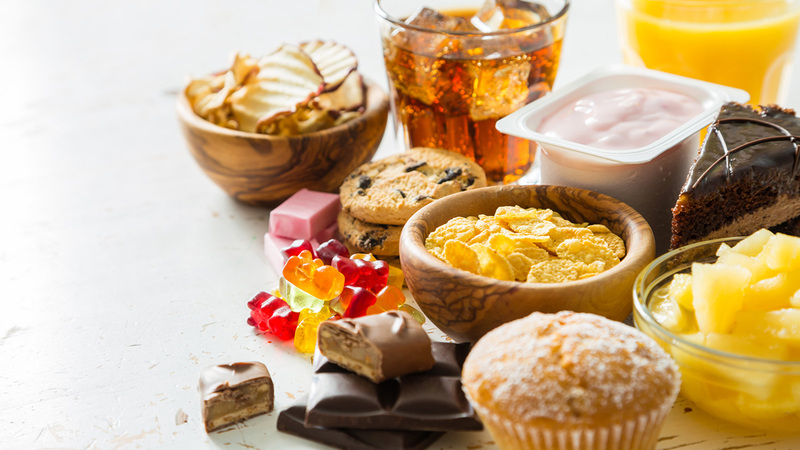 Sweets, chocolate creams, fizzy drinks, and sweeteners, raise both your blood sugar and the androgen levels. Androgen is the hormone which in excessive amounts may cause the contraction of hair follicles. The undesired effect is weak, thin and very brittle hair prone to falling out and dandruff. • Strong tea and coffee, które w dużych ilościach utrudniają przyswajanie witamin niezbędnych do zdrowego wyglądu włosów. • Oxalates which are found in sorrel, spinach, rhubarb, and beets. They might inhibit the absorption of key elements like calcium, magnesium, and zinc which are essential for healthy and strong hair. 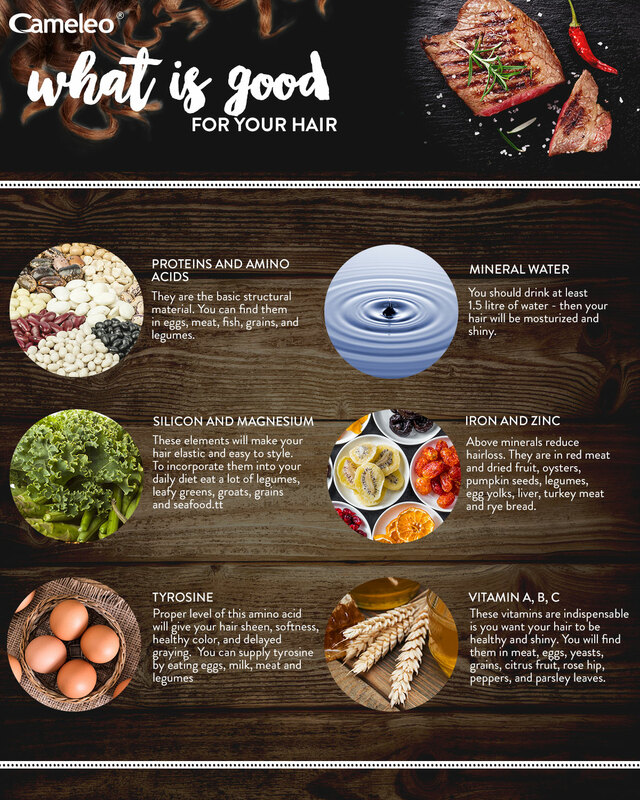 Now let’s talk about what you can and should eat to enjoy strong, healthy and shiny hair from roots to ends! • Strong and thick hair need the basic structural material, proteins and amino acids. They can be found in eggs, meat (especially beef which is rich in iron, zinc, and proteins), fish, grains, and legumes. Cheese, kefir, yogurts, kale, and broccoli are the rich sources of calcium which is also hair’s structural material. Remember, however, that every ingredient should be consumed in moderation. Too much protein might cause the excessive production of uric acid which makes hair fall out. • Moisturized and shiny hair is the matter of proper hydration. Remember to drink at least 1,5 litre of water daily to maintain a proper hydro balance of your body and enhance the transport of water to your hair and skin. • Elastic and easy to style hair is possible if you include silicon and magnesium into your diet. These elements help to deal with brittle and splitting hair. You will notice that your hair is visibly softer and more elastic. All you have to do is to add legumes, leafy greens, groats, grains, and seafood to your diet. Sea fish and nuts contain very nutritious Omega-3 and Omega-6 fatty acids which improve hair elasticity. You should also drink herbal teas with horsetail, mullein, coltsfoot, and nettle. • Hairloss will be visibly reduced if you enrich your diet with iron. It can be found in red meat and dried fruit. Also zinc is vital in strengthening your hair. Its rich source are oysters, pumpkin seeds, legumes, egg yolks, liver, turkey meat, and rye bread, to name but a few. • Dandruff-free hair is possible thanks to already-mentioned zinc which regulates the work of sebaceous glands. Among the foods with high zinc content you will find seafood, almonds, garlic, and wild rice. • Sheen, softness, healthy color, and delayed graying is the matter of proper levels of tyrosine, an amino acid which takes part in the production of natural colorant providing your hair color, melanin. You can supply tyrosine by eating eggs, milk, meat, and legumes. 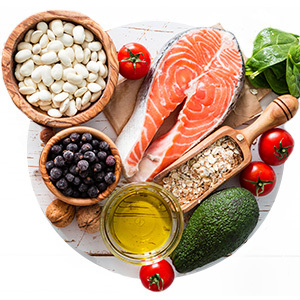 • To have healthy and shiny hair, you should also supply your daily intake of nutrients with foods containing B vitamins (especially B12), vitamin A and C. You will find them in meat, eggs, yeasts, grains, citrus fruit, rose hip, peppers, and parsley leaves. Now you know that a healthy diet should contain various ingredients that will help your body to maintain a healthy balance. Remember that moderation and regularity are essential to keep your body and mind in shape. Do not forget about professional hair care products which together with a balanced diet will help you achieve the best effects!